Sabbath Walk: Of Reformation Day, All Souls' Day or Halloween? TITLE: REFORMATION DAY, ALL SOULS DAY OR HALLOWEEN? MAIN POINT: The best way we can remember October 31st, 2014 is not to buy into the fun of Halloween, which really means nothing much, besides the candies in our mouths and cavities in our teeth. As Christians, we can honour Christ by remembering, and learning from the great Reformation in the 16th Century and to be constantly reforming ourselves. Who knows, we may very well be planting the seeds of reformation for the generations to come. The older ones tend to be a little more adventurous, donning more sinister costumes. Anyway, in good fun, I distribute the goodies liberally, to be rewarded with a musical "Thank You" as payment. Halloween celebrations are big events in the annual calendar. Students dress up for the occasion in the morning, and had special celebrations in school. At dusk, they venture out to the neighbourhoods to fill up their goody bags. All in the name of fun! Period. However, Church history offers a different view of October 31st. 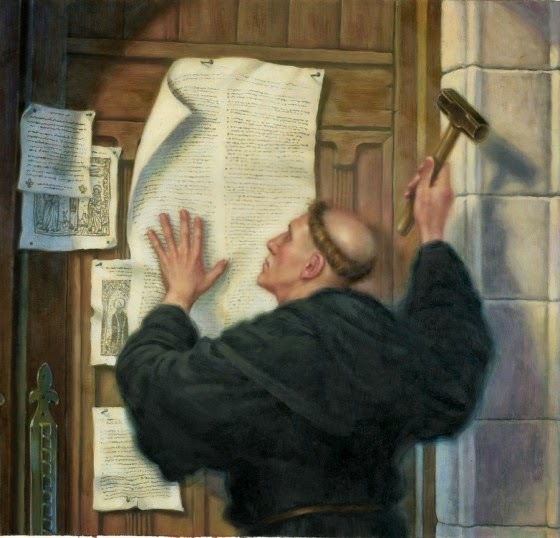 There are at least two other significant events: 1) Eve of All Saints Day; 2) Reformation Day. For Roman Catholics, November 1st is known as "All Saints' Day" followed by "All Souls Day" on November 2nd. Pious Catholics would attend Mass on the Eve of All Saints day to honour the saints of old. Believers will pray for those in heaven, those who have blessed others and brought honour and glory to God. On "All Souls Day," prayers would be offered to the rest of the people, in particular those who are considered to be still in the stage of purgatory. Over the years, the simple purpose to pray has also been mixed with superstitions and one of which is, Halloween. The word "Hallow" means "holy." In the Lord's Prayer, when we say, "Our Father, Hallowed be Your Name," we are essentially invoking God's Name is Holy. Lots of articles have been written on the origin of Halloween so I will not want to dwell much on it, except to say that pagans of old have tried to capitalize on the popular name and to do a twist out of it. In Church history, on November 1st, 1755, the terrible Lisbon earthquake took the lives of between ten to fifteen thousand people. Others gave a higher estimate of up to one hundred thousand, out of a population of 275 thousand! That is nearly a third who died in one earthquake! Many buildings were destroyed. Waters gushed in to flood many places. It makes November 2nd then, a very sobering day for survivors, to pray for those souls that perished the day before. For those who are not from the Roman Catholic faith, they can use this occasion to pray for the Church community, and the prayer to be faithful. They can remember those who had been faithful and those who had left their footsteps behind for us to follow. People such as St Augustine, who had blessed the Church with an amazing "Confessions" to show us that he was not perfect. People who fled to the desert during times of corruption to escape the clutches of the world, to give us monastic wisdom and to plant the seed of the modern University system. Or the many martyrs who died for the cause of Christ, from the first century to now. By their examples, we shall be encouraged. "As soon as the coin in the coffer rings, the soul from purgatory springs." At the heart of Luther's thesis was grace. One cannot save the soul by the transactions of indulgences. The reason the Protestant movement grew was because of several other factors, like the rise of the printing technology; the frustration of people with corruption; and the increasing tax burdens associated with the Church; and many more. People wanted change and Luther was there to supply the seeds of change. In a self-help world, people tend to do things themselves thinking that God will only help those who help themselves. Indeed, as people becomes more educated, better trained, and adequately skilled, there is a tendency to depend on oneself rather than to wait for others. If one can fix the sink, why call for the plumber? Applied to our spiritual life, we may tend to think that if we do all the Bible ourselves, all the praying ourselves, and all the Christian living ourselves, our personal Christianity would be perfect. Wrong. Christianity is not about us doing all the Church work or the devotion stuff. Christianity is about Jesus Christ and how our work and activities honour God in Christ. Kenneth Richard Samples, an adjunct professor at Biola University adopts a 3G manner to think and to live out the Christian Life. The first is Guilt, which is a recognition of what sin has done to us. The law convicts us of sin and pronounces us guilty. Thankfully, this is not the end of the story. The second G is Grace, that because we cannot save ourselves, God in His Mighty Grace in Christ, forgives us of our sins and cleanses us from all unrighteousness. The third response is Gratitude, which ought to define how we live our Christianity. Guilt, Grace, Gratitude. Christianity based on Guilt alone is debilitating. Christianity that ignores sin and guilt and assumes only grace without repentance is antinomianism, something Bonhoeffer calls "cheap grace." Michael Brown calls it "hyper grace," which is that overwhelmingly positivistic message that drown out all negativity. Others would simply prefer a "balance" of guilt and grace as a way to move forward. "92 - Away with all those prophets who say to the people of Christ, 'Peace, peace' and there is no peace! 93 - Blessed be all those prophets who say to the people of Christ, 'Cross, cross' and there is no cross! 95 - And this be confident of entering into heaven through many tribulations rather than through the false security of peace." Theses 92 and 93 are written against prophets who cry out false peace and no cross. Theses 94 and 95 are exhortations to all to let Christ be the way, the truth, and the life for all. Perhaps, the way forward is to learn from the Reformed movement who had this catchphrase: "Reformed but always Reforming." Good reminder.